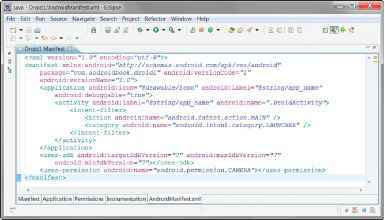 The Android manifest file is a specially formatted XML file. You can edit the XML manually in the AndroidManifest.xml tab of the manifest file resource editor (see Figure 5.5). Figure 5.5 shows the Android manifest file for the Droidl project you created in the first hour, which has fairly simple XML. AndroidManifest .xml tab of the Eclipse manifest file resource editor. Note that the file has a single <manifest> tag, within which all the package-wide settings appear. Within this tag is one <application> tag, which defines the specific application, with its single activity, called DroidActivity, with an Intent filter. In addition, the <uses-sdk> tag is set to 3. Now let's talk about each of these settings in a bit more detail.